Hope you enjoyed a relaxing Labor Day weekend! We had company in town, and between that & my daughters returning to school yesterday, it feels like I’m just now catching up. Time for something fast! Thanks to our garden, we’ve had a surplus of cherry tomatoes this summer. We planted both red & yellow and although the red are good, the yellow are THE BEST TOMATOES I’VE EVER EATEN. Sorry for the shouting, but my goodness. Each & every one has been sweet and crisp and perfect. Anyway, now that school’s in, it may feel like summer’s over. This morning in Portland, for instance, it’s about 60 degrees and raining. But in truth there are still 2 weeks until fall and plenty of tomatoes left to harvest. 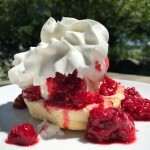 This recipe is a great segue between the seasons. It’s hearty and healthy, yet thanks to the tomatoes and lemon, it’s also light and sunny and refreshing. It tastes great the first day and is even better the next (I love leftovers). And if you’re anything like me (bulk food shopper/stockpiler extraordinaire) you may already have everything on hand. BONUS: 20 minutes start to finish! No-salt-added tuna is sold readily in supermarkets, typically alongside the regular canned tuna, occasionally on the “natural foods” aisle. In a real pinch, you can use regular (read: salted) tuna. After draining, place the fish in a fine-mesh sieve under cold running water and rinse it thoroughly. You’ll be able to remove a lot of the sodium this way. 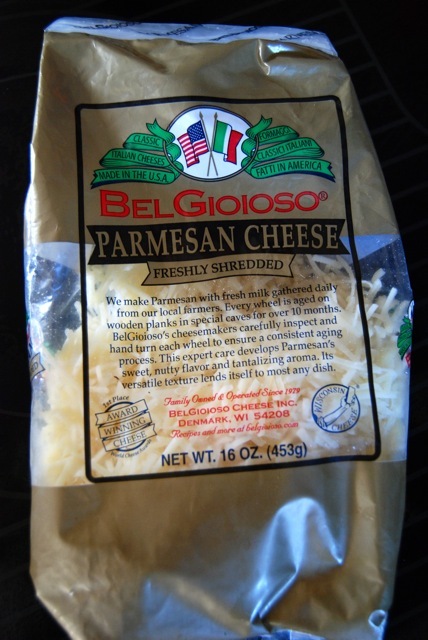 Second, I recently found BelGioioso Freshly Shredded Parmesan Cheese has only 45 mg sodium per tablespoon!! Waaaaaaay lower than most on the market. Here in Maine, I’ve seen it not only in the specialty cheese sections of my local supermarkets, but even at BJs wholesale club. Inspired by Fine Cooking magazine. Cook pasta according to directions. Drain, leaving a tiny bit of water in the bottom of the pot. Melt the butter in a large saute pan over medium heat. Add the tomatoes and garlic and cook, stirring, 3 minutes. Add the tuna and lemon juice and cook, stirring, 2 minutes. Remove pan from heat. Add contents to the pot of pasta, along with the grated lemon zest and Parmesan cheese. Sprinkle with the chopped parsley and season to taste with freshly ground black pepper. Serve immediately. 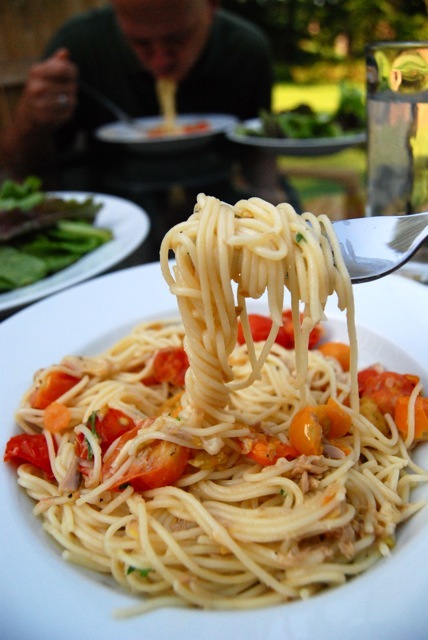 This entry was posted in Main Dishes and tagged BelGioioso Parmesan Cheese, no-salt-added tuna. Bookmark the permalink. You are so right about those tomatoes! It’s the third year I’ve grown them and there are ripe ones on my plant every morning when I go out there. I need to pull mine, but the scraggly thing is still producing, so??? Love this dish. The tuna sounds great in it — never tried it so will have to add this to my “what do I make for dinner” options. Oh baby, keep that plant going till it won’t grow no more!! I’m already looking forward to planting next year. We’ve decided to do extra yellow cherries. YUM. Tomatoes were always my very favorite part of my parents’ garden (although for some reason they never tried growing cherry tomatoes… hmm…)! 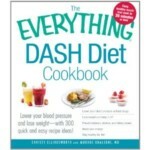 This looks SO good, Dishy! Thanks Inky! I harvested most of the remaining plum tomatoes this afternoon & am making sauce. House smells great! Fresh tomatoes just make everything better! This pasta looks wonderful! These coincidences are weird. I bought a basket of grape tomatoes Saturday at the farmers market but haven’t done anything with them other than pop a few in my mouth. And I made a special trip to the grocery store to pick up a bunch of soft foods in preparation for my husband’s dental work and oral surgery. Low sodium tuna was on the list. He’s not going to be able to enjoy tomatoes or any chewy pasta for a while, but your post gives me inspiration for my dinners. Ha, that last picture is the best. I had a tomato and tuna salad this weekend! And I don’t really love either one of those things! And in fact, I hate one! And it makes me really jealous to see you talking about how delicious your tomatoes are. You almost had me convinced for a second. Delicious! Maybe that will end up on our table tonight. Thanks for reminding about the possibilities in my kitchen tonight! 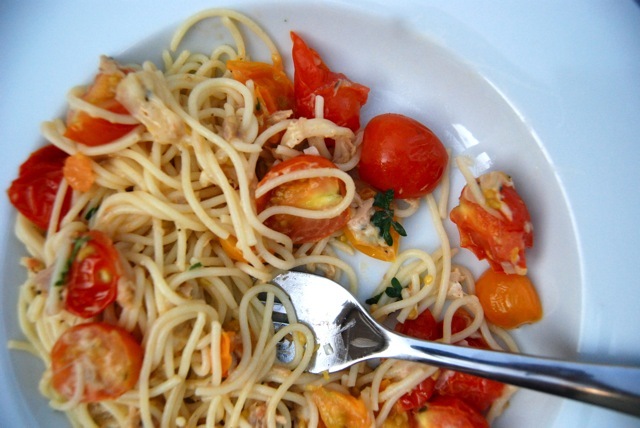 I love using cherry tomatoes in pasta dishes like this. They add so much flavor and I love how they taste when heated with the pasta! This pasta looks wonderful! Beautiful tomatoes. Your recipe wears them well. Love love love. This is an easy and delicious pasta dish to whip up in no time! It’s full of flavor and pizazz! Whoo-hoo! This sounds great! I didn’t know there are no sodium tuna cans out there, thanks! Thanks so much for the lovely comments, everyone!! This is such a great dish for a busy night – and if you have leftovers, a terrific lunch the next day. Shambo – you & I must be channeling one another! LOL Really hope your husband is feeling better soon. 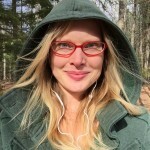 Katie, there are *that good* – really! Lynn, so glad to have helped. But I must say, the no-salt-added tuna still has naturally occurring sodium (on average, 105 mg per 6-oz. can, some more, some less) – but SO much lower than the standard salted kind! I love the combination of lemon, tomatoes and tuna. It makes for great, bright and summery dishes! I couldn’t agree more, Pola! What a gorgeous dish. I love the simplicity and health building qualities. Citrus zest is a great choice – I find it really punches through flavour wise in recipes. Lovely. Thanks so much, Kelly! Hope you try & enjoy it. All I can say is: YUM! I can’t wait to try this one:). Great post!! Thanks so much, Erika. Hope you enjoy it! Delicious!! My new favorite low sodium dish. And it’s filling too. YAY! Thanks so much for letting me know, Dorie. Great to hear! I made this dish for dinner tonight, and my whole family LOVED it!! It is deliciously tart and savory. Thank you!! Terrific Leslie!! So glad you enjoyed it. Thanks so much for taking the time to let me know.